Located in Newton and representing clients both inside and outside Massachusetts. At Tanowitz Law Office, P.C. we handle civil litigation in both personal and business matters. For more than a decade, clients have come to rely on the personal attention, quality service and reasonable rates offered by lead Attorney Ellen Rappaport Tanowitz and our team. 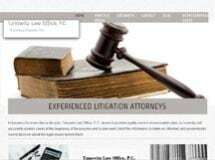 Whether engaged in a landlord-tenant dispute, residential construction dispute, breach of contract, employment litigation, personal injury, land use or zoning issue, general business dispute or other civil ligation matter, we at Tanowitz Law Office possess the intelligence, skill and resources necessary to see that every client has the information they need to make economically sound decisions. We provide our clients with counsel informed by tested, real-world experiences from our years of litigation experience in state and federal courts, our decades of combined legal experience, and having resolved a variety of issues through arbitration, trial, mediation and settlements. In many instances, clients return for future counsel and representation after experiencing the professionalism and results-driven counsel that is synonymous with Tanowitz Law Office. To discuss the circumstances of your legal matter in confidence, contact our Newton office and schedule a consultation with the TLO team of lawyers. Professional, experienced and loyal, we invite you to discover our difference at Tanowitz Law Office, P.C.